When you choose Embrich Plumbing to meet all of your plumbing needs, you’re choosing a plumbing company that has been locally owned and operated since 2001. You can trust us with any of your plumbing concerns, no matter what your needs may be. At Embrich Plumbing, we make customer satisfaction our number one mission. Our staff of team-oriented specialists is dedicated to customer service – in more ways than one. Our 24 hours a day, seven days a week plumbing service proves we are always there when you need us. Whatever you need, we will do our best to make you happy. From the moment you call Embrich Plumbing, you’ll feel welcomed. We want you to feel like family with us. We work hard to ensure that getting your plumbing needs met is an enjoyable experience, which is why we aim to offer the best services and information available. We even work hard to make sure that our staff knows the most up-to-date information and all the latest technology for all of your plumbing concerns. But don’t just take our word for it – look at our customer reviews to see what our satisfied customers are saying about the service they received from us. Simply give us a call and we will be happy to help you with all of your plumbing needs. Owner & son came out & cleared sewer backup as well as thoroughly explaining situation after using camera to pinpoint sewer line with location device. Very professional as well as use the latest high tech equipment. I just wanted to take the time to tell you of my experience with Embrich Plumbing this morning. Your employees, Chase and another young gentleman (I didn’t catch his name) came to install a new water heater in my home. You should be very proud of these men and their work ethic. They were very courteous and explained in detail all that they would be doing to install the unit. In this time that we are in, courtesy, respect and politeness are rare indeed. These men reflected very favorably upon your company and your business mission. I would definitely call upon your company again in the future and would surely welcome these gentlemen in my home again. Thank you. Jim couldn’t have been more helpful, thoughtful, patient, professional, neat and clean. He spent a lot of time answering my questions. I think you have a keeper. I will definitely call Embrich Plumbing again. Love your service! Professional, prompt, can call with problem anytime. The best thing is, you really know your business & when you fix something, it will be done correctly. Really appreciate your concern & work on our “special situation (difficult! )” sump pump situation. You really cared about doing it right. High quality is obvious. Love the shoe booties! I don’t mind paying for quality. Otto & Mary Ellen D.
We highly recommend Embrich Plumbing. Del and his team are always dependable, fast and professional. We’ve had the, do a variety of plumbing projects over the last 10 years and they’ve provided top notch service and expertise. We won’t use anyone else. Excellent service! Just wanted to take a moment to say we were very pleased with the service we received. As we stated, we had called Tim Meredith and he referred us to you. We are glad he did. It is nice to have a plumber that you can trust. We appreciate you taking the time to explain various aspects of the hot water heater. I was able to go back to the office and get done what I needed while I awaited your phone call that you were on your way. It worked out perfect! 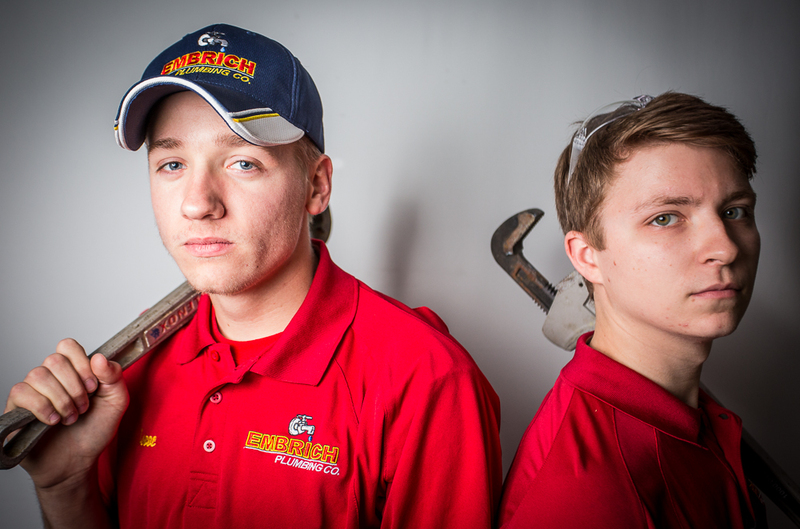 Tyler and Isaac were extremely professional, knowledgeable and polite while performing their duties in our home. We couldn’t have had a better customer service experience and will definitely have Embrich Plumbing back for all our plumbing needs. May God continue to bless you, your family and your business. Pros – Immediate responses via phone and email… Fixed water heater under warranty… Great customer service… Will recommend… thanks! I just had Craig out to my house. I have to say I was very impressed, and he was the nicest guy. Just wanted to let you know that you got some good guys working for you. If I could give Embrich more than five stars I certainly would. I had serious plumbing problems and they replumbed the entire house, working diligently, and overcoming challenges I believe many other plumbers could not, or would not, tackle. I have tried several plumbers in the past and Embrich is the only company I trust to get the job done and get it right. Their team is professional and they always go the extra mile. The owner, Del, his son, Tyler, and staff, Isaac and Jim were awesome. Their office staff, Jennifer and Lisa were always very helpful. Unlike other companies, they answered the phone promptly, were extremely pleasant, and followed through on every request or concern to make sure my needs were addressed. Bottom line, if you are looking for a competent, dependable, and professional team you can trust, you won’t go wrong with Embrich. I now have plumbing that works and a new bathroom unit. Yeah! Thanks Embrich!